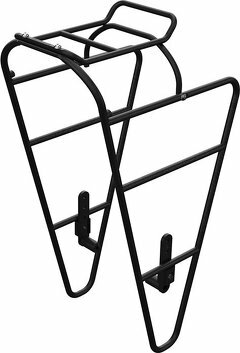 This article is a comparison of low rider racks intended to carry a set of panniers on the front wheel of a bicycle. They are used for longer cycling trips. Carrying weight at the rear and front helps keep the bicycle balanced and improves handling. The term low rider is sometimes also used for cars which have been lowered, or cruiser bicycles with a low seat, those are not the low riders I am talking about here. 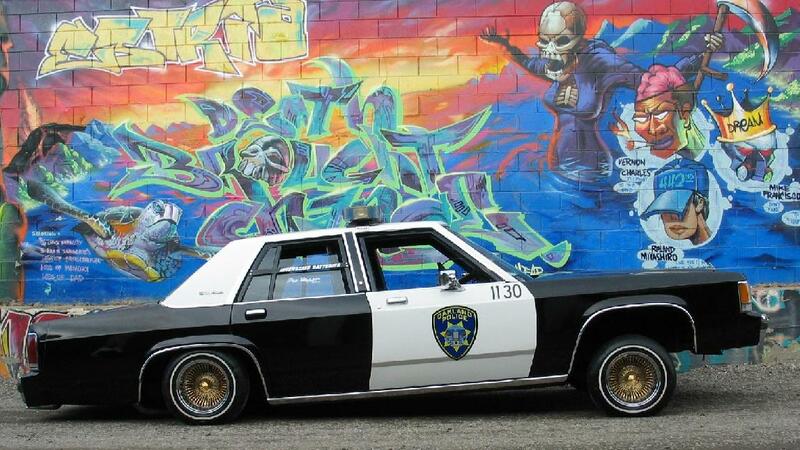 A police car low rider. The kind of low rider this is about. The best place for the weight in the front is near the center of the wheel. Low rider racks get their name from the fact that they keep the luggage at a low height. I have limited myself to the low rider racks that are widely available (on different continents) from reputable manufacturers. On the bottom of the page there are some references to other low riders that may be a little harder to get your hands on. The low riders here are made out of aluminum or some form of CrMo steel alloy. Most are made out of tubing (hollow), some are of rods (solid). There are many stories going around about certain materials being better than others. Aluminum breaks, steel rusts, and stainless steel is expensive. I do not have any research to back up any claims regarding failure rates. 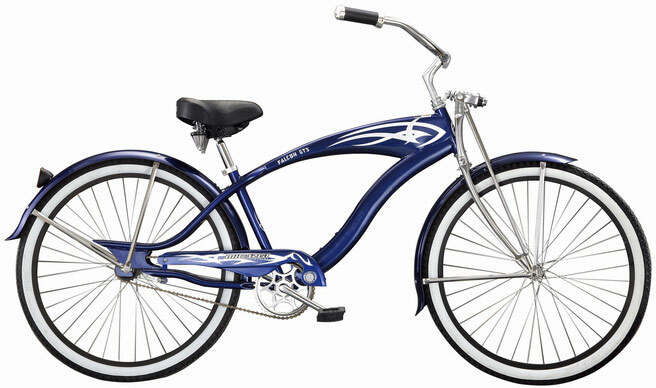 Whether a low rider fits on your bicycle depends very much on the eyelets on the front fork. Ideally your fork has two on each side near the axle, and another one 175 mm above it. Some forks have even more; some don't have any eyelets at all. 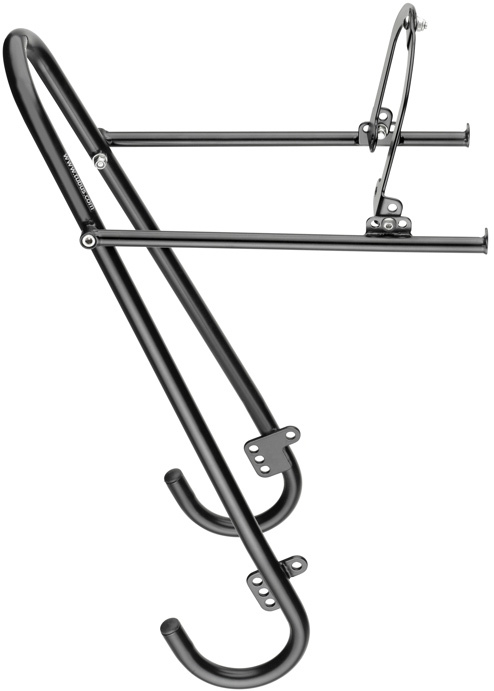 Some racks are designed to mount on the axle, or additional mounting parts that work with clamps are sold separately. All the low rider racks here are suited for 26" and 28" wheels. However, some fit various tire sizes better than others. This is addressed for each individual low rider. They all have a diameter of ~10 mm for the pannier rails. Front racks that have a platform but do not have rails to hang panniers are not included in this comparison. Brands are in alphabetical order. Highest figures are in bold (does not imply better). Prices are as found at various large online retailers in early 2014 and are rounded up. Prices with asterisk are converted from another currency to euro. It has two rails to hang panniers low for optimal stability or high for increased ground clearance. The platform on top is removable to save weight (152 grams) when not in use. When writing this article not all specifications were available because the product page has been broken for several weeks. Blackburn did not reply me when I requested the specifications and notified them of the broken page. This does not bode well for customers seeking support for Blackburn products. Since then a reader of the website has provided me with the specifications. Very affordable low rider rack made out of aluminum rods. Its rated capacity of 11.4 kilos may be a little low for some. The SFL-1 is available in the colors black and probably gray. At 450 grams the Hebie Low Rider 195 is the lightest low rider rack in this comparison. The weight is due to the elegant design that has a minimal amount of tubing and welds. Aluminum tubing is used, as opposed to rods, or steel tubing. At 20 kilos it has a higher rated capacity than many other low riders. Hebie says their low rider is not designed for off-road use. Therefor I would not recommend it for expedition touring in places where you may encounter rough terrain, also because aluminum is not as easy to weld back together as steel alloy. The Hebie Low rider comes in the colors black and gray. 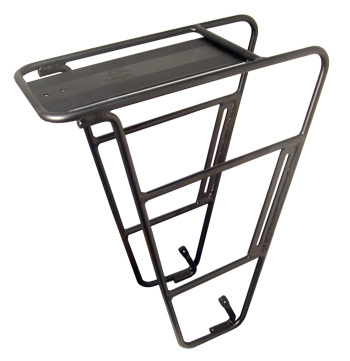 There is an optional kickstand (662 SL Low Rider stand) available. The recommended retail price is €56, but some webshops offer it for less than €40, making it one of the more affordable low rider racks in this comparison. Made out of aluminum rods rather than tubing, it is significantly heavier than the Hebie Low Rider. The retail price is lower, but the Hebie can be found for a similar price. I expect the Jandd to be more readily available in the USA, while the Hebie is more easily found in Europe. Like Jandd's other rack, this one is also made out of aluminum rods. It is double welded for extra strength. It has two rails to hang panniers low for optimal stability, or high for increased ground clearance. On top there is a solid platform that is 15 centimeters wide. 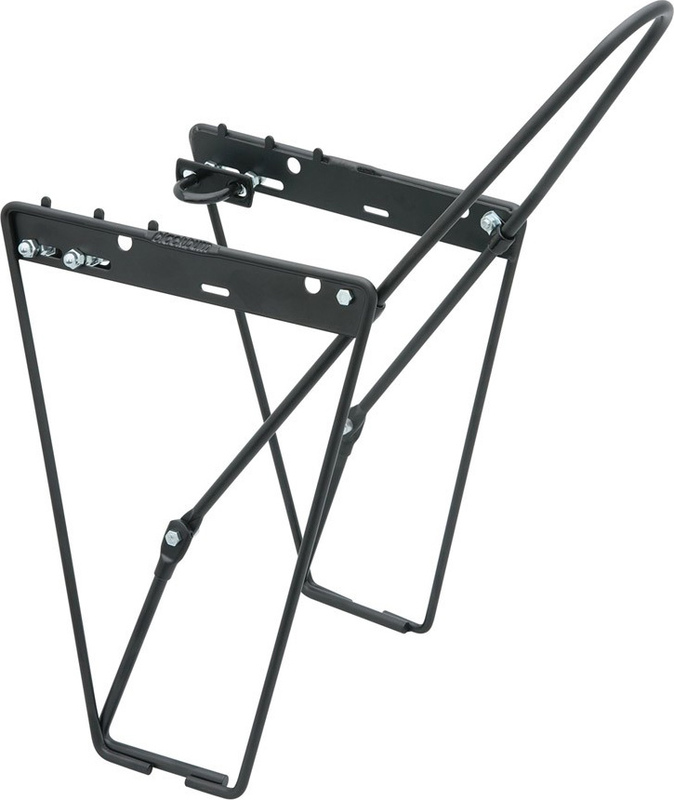 The features are very similar to the Surly Front Rack. It is only rated for loads up to 18 kilos, but if that is more than enough for you, it might be interesting as it is both cheaper and lighter than Surly's rack. Old Man Mountain is a company in the United States that is known for their wide range of racks that do not require eyelets on the frame. Instead they mount on the axle of the wheel. The Ultimate Lowrider has two versions. They are very similar, except that the hub-mounted version is slightly heavier at 815 grams. There are various options for a mount on the V-brake bosses and clamps around the fork as well. There are also two other low riders with platforms. At almost 1400 grams, the Surly Front Rack is among the heaviest in this comparison, though also among the most versatile. It has two 10 mm rails to hang panniers on. Lower is better for balance; higher gives more clearance on rough terrain. Additionally, it has a platform on top for even more luggage. The platform is 23 by 17 centimeters. The rated capacity of 32 kilos is more than any other low rider in this comparison, however just because you can does not mean you should. 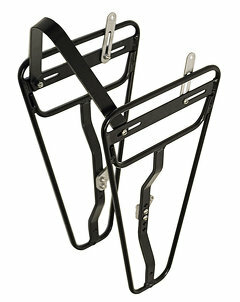 The Surly Front Rack is available in the colors black and gray. 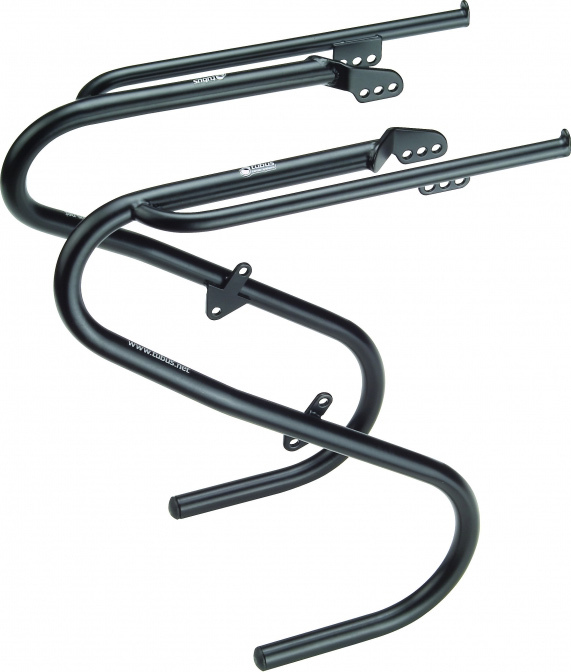 Tubus is a German company that manufactures bicycle racks from steel alloy tubes (hence its name). 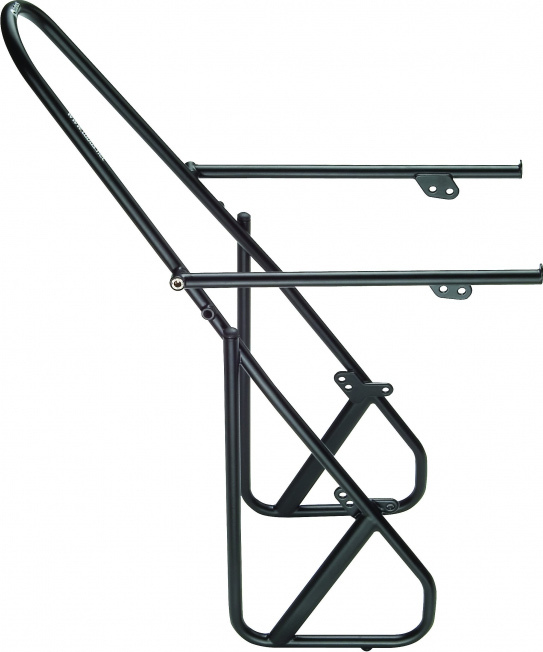 With five low rider racks in this comparison which is more than any other manufacturer. 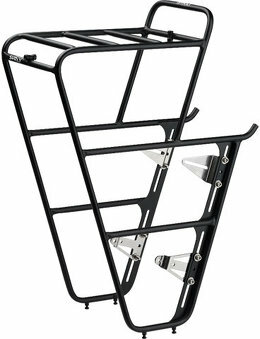 Tubus displays the weight for the rack and mounting hardware separately, while other manufacturers only provide the total weight. In the comparison table I used the total weight. In my opinion, Tubus does not do a very good job of differentiating between their low riders. The Tubus Tara is the lightest, cheapest and strongest one they have. The others have some unique features that might appeal to you, but the Tara seems the best choice for a Tubus low rider in most cases. Tubus does not have any low riders with a platform. Tubus does offer a kickstand and spare parts for their low rider racks. Tubus racks can be quite expensive, but at bike-components.de they can be found significantly cheaper than any other shop. I have bought from this shop several times, with very good experiences. In the instructions Tubus highly recommends their anti-scratch protection kit, to be used with all their racks. This kit is sold seperatly. Our DUO used to be a TARA, until we made it "bow-free" If your fork has inside and outside eyelets, then the DUO is your choice carrier. DUO and TARA tolerate extreme loads and almost all panniers. Since the Tubus Tara is both stronger and lighter than the Duo it is kind of strange to call this "your choice of carrier". Even if you have inner eyelets in the fork the Tara still seems the superior choice. If you have wheels with a smaller diameter than 28", the Duo will look better since the bow will not stick out over the wheel. The Duo will fit regardless of tire size, while the Tara will only go up to 50 mm (or 60 mm for the wider version). The lack of a bow will also help in some situations where you have to stick your front wheel in some contraptions, for example when transporting the bicycle on some trains. From what I have seen the Duo is even more expensive than the Tara, but if you can get it cheaper it might be a good alternative. The Tubus Duo is available in the colors black and silver. The Tubus duo consists out of two parts that are not connected with a bow. The Tubus Ergo has a bow over the wheel for extra stability. It has the same capacity as the Tubus Tara, yet is heavier and more expensive. 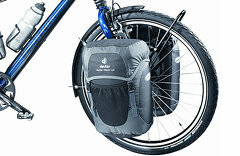 The only reason to choose this over the Tara would be because it has more material on the bottom to attach the panniers. The Duo/Smarti/Tara need some special parts to secure Ortlieb bags with the QL-1 system; the Ergo does not. The Tubus Ergo is available in the colors black and silver. The Tubus Nova looks very much like the Ergo, the main difference being that it is made out of stainless steel. This material is slightly stronger, looks shiny, relatively easy to repair and is also more expensive. 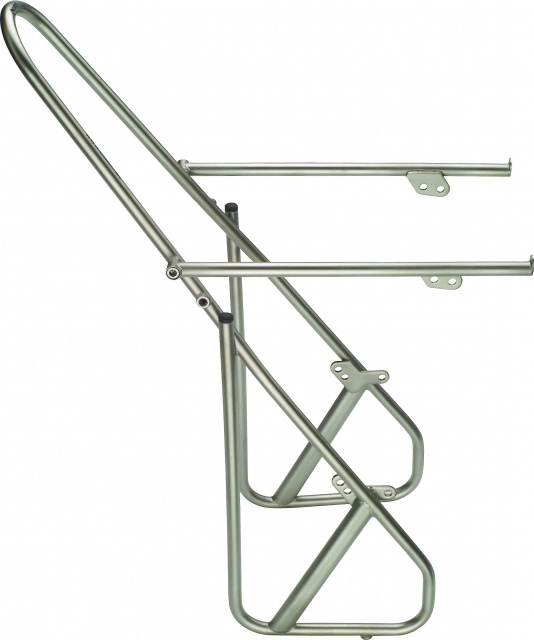 According to some, stainless steel is the best material for racks for remote expeditions. 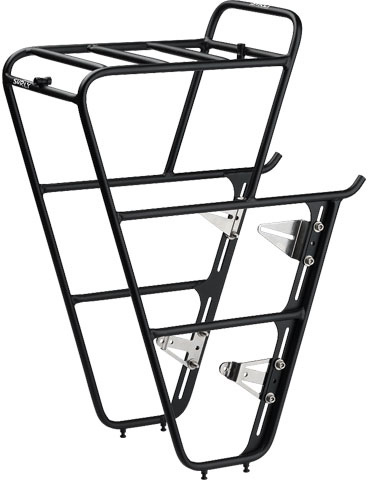 However, the rated capacity of this rack is only 10 kilos, which makes it one of the least capable racks. Tubus says that the Tara is their strongest low rider (and also lighter and cheaper). 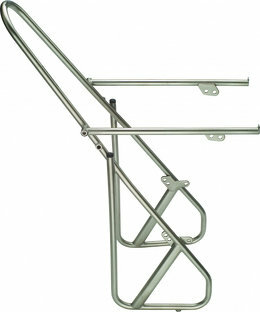 The number one reason to go for this rack would be that it looks shiny and does not easily rust. The Smarti does not require eyelets on the fork. Instead, it mounts on the V-brake bosses. As a result, the bar is higher than with other low riders. The bow is made out of strong 14 mm tubing. The Tubus Smarti comes in the colors black and silver. Last but not least is the Tubus Tara. According to Tubus, it is their best selling low rider. It has been refined over 18 years. It is strong and durable because it uses a thicker 14 mm tube. The rail for the panniers is still 10 mm so that most will fit without problem. Tubus says this low rider is stronger than all their others and recommends it for "rough use" and heavy loads. Interestingly, this low rider is also among the lightest and cheapest in Tubus' lineup. This goes a long way in explaining why this is their best selling model. There are three versions of the Tara; black, silver and a black "Big Apple" version for wider tires. The standard version supports tires up to 50 mm, while the Big Apple version goes up to 60 mm. The name is probably related to Schwalbe's Big Apple balloon tires. My review of the Tubus Tara "Big Apple"
According to the Adventure Cycling Association, Arkel makes a low rider too. However it is not included because I cannot find it on Arkel's own website. At 450 grams it is pretty light, but it is unclear if this is with mounting hardware included. Its most interesting feature is that it can easily be leveled, so it might be good for forks that have an unusually small or large offset. At first I wanted to include Axiom in the comparison. However their claims do not add up. 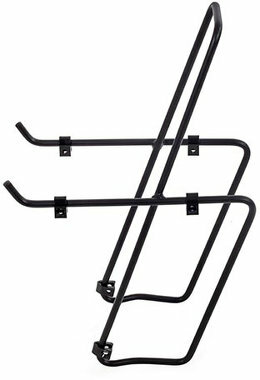 Their low rider rack can supposedly carry 30 kilos, while using clamps rather than eyelets, is very light, but does not have stabilizing bow and is also cheaper than any of the other low riders in this comparison. Various reviews on Amazon confirmed my suspicions that the Axiom low riders are not that good. They do not meet my standards for a reputable manufacturer. If you have straight forks, this might be a useful rack for carrying no more than 5 kg per side. The build quality is OK but not spectacular. The hardware is confusing and difficult to deal with. Once attached, the angle is so great that panniers become only half-useful and are at risk of falling off. I ended up ditching it. Bruce Gordon Cycles is a small company in California, USA. 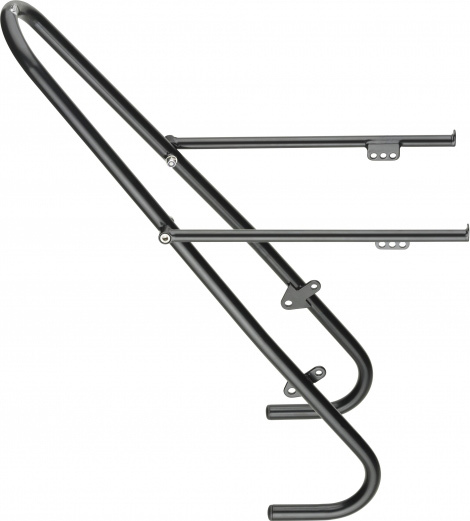 They make a low rider rack with hand welded 4130 chrome-moly tubing. At $185 USD it is among the more expensive low riders here, but according to the makers it is the "the best-made, finest looking front bicycle rack on the market." Not included in the comparison because of the limited availability. Cordo is Dutch company "powered" by Agu that makes cycling clothes and bags. They have two low riders made out of aluminum. They are relatively cheap but do not appear very easy to find outside of Western Europe. Their website does not list specifications. An interesting product that allows you to mount luggage on a front fork with three eyelets. The Gorilla Cage is similar to the Salsa anything Cage, but can be detached entirely, leaving just some "cleats" in the eyelets. Free Parable has some other very cleverly designed products for carrying bottles and luggage on bicycles, also for bicycles with small or unusual frames. 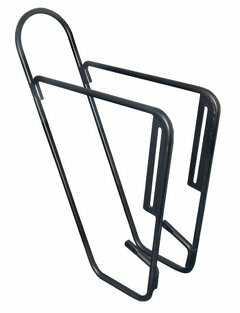 Bicycle manufacturer Giant sells an aluminum low rider called the Rack It Front Rack. They are made out of 13 mm black aluminum tubing and are mounted using two bolts. Giant does not provide information on the weight but states the maximum load is 15 kilos (probably spread over both sides). The lack of a support for an inner eyelet or stabilizing bow reduce the stiffness when loaded making it harder to control the bicycle. The additional stress on the bolts will make them more vulnerable to rattling loose. Massload is a Taiwanese company that sells a variety of bicycle parts, but it unclear where the products are available. Made in Japan, sold in the USA, Rivendell Bicycle Works has two low rider carriers, one with a platform. Solid, but expensive, at $200 USD it even beats the Bruce Gordon. Salsa is an American bicycle manufacturer which has been getting distributors in some countries in Europe. Besides the two low riders linked below they produce the Salsa Anything Cage which can be mounted on front forks with three eyelets, which provides an low capacity alternative to front panniers. Salsa's own bicycles and various other manufacturers like Surly (USA) and Genesis (UK) have forks with three eyelets. Thorn is a British manufacturer of touring bicycles. The low rider is made out of steel tubing and weighs 560 grams. There is no bow, so it will fit any wheel size. According to Thorn it is one of the strongest low riders on the market, but the rated capacity of 12 kilos is similar to others, only when mounted with thicker M6 bolts can it be loaded up to 18 kilos, but most bicycles do not have mounts for M6 bolts. XLC has two low riders, which I did not include in this comparison because they do not meet my requirement as a reputable manufacturer. XLC claims to be a young Germany company and I have been seeing XLC products pop up more and more, but I am not convinced of their quality. Their website is riddled with unsubstantiated marketing claims and spelling errors, while lacking meaningful specifications of their products. The vast amount product offerings is a strong indication that they are selling re-branded items from Asian manufacturers rather than designing and producing anything themselves. The Tubus Swing is not included in the comparison table above as it is discontinued and no longer sold. However I mention it here for completeness. The Swing is meant as a low rider for suspension forks that do not have any eyelets. Unlike regular low riders the horizontal rails are positioned slightly above the front wheel. This gives it a higher center of gravity, but does allow for more clearance on the bottom, which can be nice on rough terrain. Some models of recumbent bicycles have a smaller front wheel. Luggage is usually carried on a rear rack or special bags hanging underneath the seat. 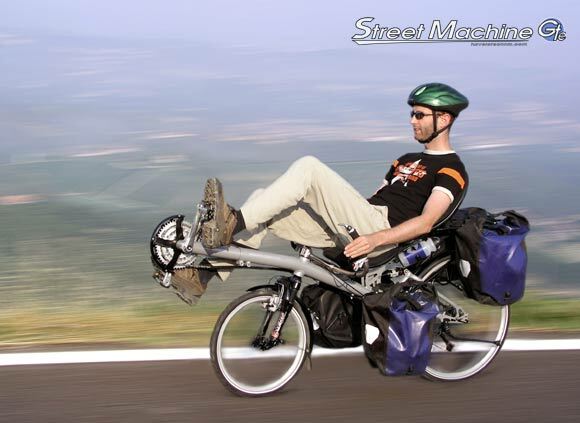 HP Velotechnik has a solution for specific recumbent bicycles. A special low rider rack that is mounted in between the wheels on which low rider panniers can be mounted. 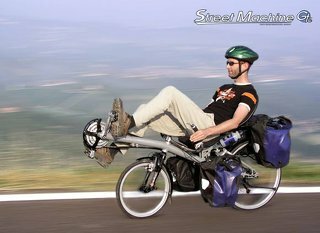 Recumbent manufacturer Azub also has a touring specific recumbent bicycle with an optional expedition rack for low rider panniers. If none of the offerings suit you, it is also possible to build something yourself. The link below is a German article about building a low rider rack and panniers. If you do not have that much stuff to take with you, you can simply go without front panniers and use a handlebar bag and/or frame bag to distribute the weight better. I have also written a front triangle bag comparison and top tube bag comparison which show some other options for more light weight bicycle touring. If you have any suggestions for additions or corrections to this article please contact me.